How to convert knife edge angle “ratios” into degrees? European-style Japanese knives seem to be described (also here and here, and in my most recent post) in terms of "ratios" that always add up to 100. It's not exactly clear what this means in terms of angles off the center plane of the blade. It appears that, even on knife forums, there is some confusion as to what these numbers mean. 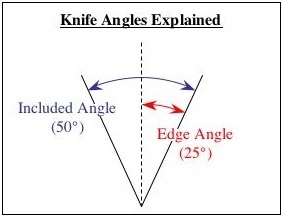 My first thought was that they were actually angles, since a 30 degree angle is common on European knives. Upon reflection, though, that can't be--when you're sharpening a 70/30 knife, dragging across a stone at a 70 degree would be a catastrophe. What, then, is that magic number, and how does it vary in relation to these "ratios"? I found this on chefknivestogo and I think it explains it quite well. RAY <> A "50/50" usually references an edge. So on the cutting edge, it is an even 50/50 "V". It can be 50/50 at 12 degrees or 50/50 @20, but each sides angle is equivocal. 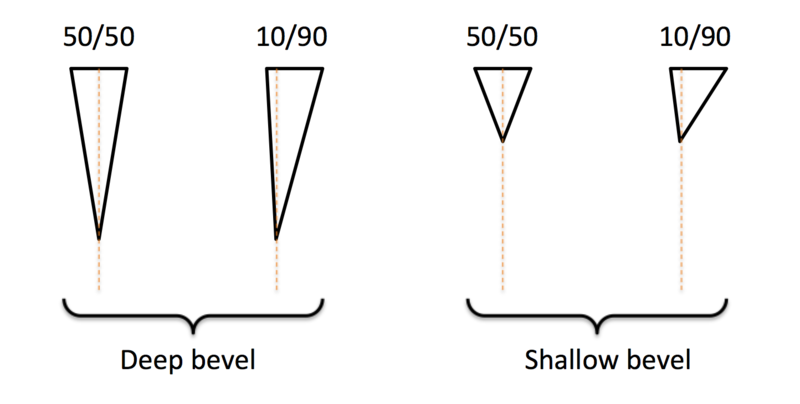 Clearly, the edge angles for deep bevels are much smaller than the angles for shallow bevels, even at the same bevel ratios. Not the answer you're looking for? Browse other questions tagged equipment knives sharpening or ask your own question. Am I using my knives for the correct jobs? Will a sharpener for a wider edge ruin a knife with a narrow edge? How do I use this knife sharpener? How can I troubleshoot unsuccessful knife-sharpening? How to sharpen knife with chunk missing?